I currently use the Panera rewards card and love the perks it has but I go to Panera the same amount I would if I didn’t have the card. I rarely ever go to McDonalds and them introducing a loyalty card will not increase the chances of me going there. I don’t think that loyalty cards will have a huge impact in traffic and sales but customers do appreciate them and when customers feel appreciated they typically are more willing to spend money at a particular company. Great post, I think the loyalty card will keep their customers loyal. I believe so because I am more attracted to places that reward you with points leading to discounts or free services. For example, I always go to the same nail salon because on your 10th visit, you get a free manicure. Then begin all over again! 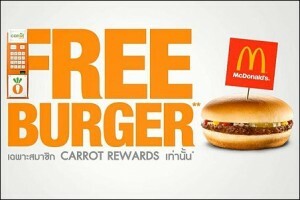 If McDonald’s had a rewards program like that, I would be likely to stop in more often, increasing traffic and sales. I think it’s hard to distinguish between a McDonald’s loyalty card and a Panera loyalty card simply because they have different focuses in terms of values and goals. McDonald’s is a fast food restaurant, and usually the whole point of going there is convenience or low price. Panera, on the other hand, is competing more on a healthy and fresh food quality. Although they are different, I could see how a loyalty card would work for McDonald’s for customers who go there regularly; however, they’re prices are so low, I don’t see how making a 99 cent item free will help increase traffic to their locations. I’m very interested to see if this does increase sales during its roll out. I think a rewards card at McDonalds is a great idea! I would agree with the fact that people go to McDonald’s for a bargain so giving away free items would add incentive for consumers to go there. I have a Panera rewards card and go there over it’s competitors because I know I am building points. A rewards card could definitely keep clients loyal, increase traffic, and increase sales for the company-or at least it couldn’t hurt. Personally, I think I’d use a McDonald’s rewards card to try to get free drinks, like coffee and soda. Even if people don’t necessarily love McDonald’s food, they could use it to build up points for morning coffees! As a cashier at Panera, I am not new to the idea of a loyalty card. Customers get excited when they feel like they are getting a discount. Cards like these provide the element of surprise of what deal they will receive next, as well as a feeling of satisfaction for being rewarded for their loyalty in the company. I believe that McDonalds could definitely use that extra push for customers, and a loyalty card may be the right solution. When people think McDonalds, they think of a fast and inexpensive meal. If a loyalty card was created, it would drive customers to keep making those small and cheap purchases in hopes for a reward. It would not necessarily lead to more customers, but the purchases by loyal consumers would become more frequent. Great post! Yes, I believe having a loyalty card will have customers coming back. People love deals, let’s say they have to buy 3 burgers to get the fourth free, it is very likely that they will take advantage of that. This will increase sales because it will be a place where they feel valued and in someway get a small portion of their money back. I have loyalty cards and it’s great having a discount. At speedway, they have a points system that adds points to your card during every purchase and you end up redeeming them for something. I think this is an interesting move for McDonalds. What I think is another interesting question that we will have to wait to find out the answer to is,”who’s next?” When McDonalds introduces their loyalty card and if it is successful, I am sure all of the other major fast food chains will be quick to follow. Everyone loves free stuff, even if you are only saving a dollar. It is hard to say if this will drastically help McDonalds increase traffic or sales, but I think that this new loyalty card will spark a bigger change in the fast food industry. I found this post interesting because recently the food trend has turned around from eat junk to eat healthier wholesome food. Now I am pretty sure Mcdonalds is normally not perceived as healthy and definitely not wholesome, so having a loyalty card might be a good initiative to increase customer loyalty. However, Mcdonalds has clearly been struggling in retaining their customers in recent years, as they’ve tried to incorporate salads and apples as sides instead of fries for kids in addition to becoming primary sponsors for the Olympics for the coming years, they are clearly trying to delude their customers into believing that they have joined the healthy food bandwagon. Although I am not sure that this attempt at rebranding their image is helping, so a loyalty card might be their best bet…for now. I believe Loyalty cards are a thing of the past, the new trend is to have McDonalds create a smart phone App that will act as a loyalty card and would be updated more regularly and has the opportunity to grant instant saving, advertisement direct link to the consumer, allow orders for pickup or home delivery, and utilizes the points accumulation tactic that eventually leads to some discount. This will raise MacDonaled’s shares, foster sales, increase loyalty and rate of return. Today, smart phone apps make all types of communication more pleasant and appealing to all customers. Therefore, by adapting this trend MacDonalds can get a good edge over their competitors, impact their customers’ mind greatly, thus increase loyalty and face value of their business.